This week I will wrap up our three-week look at cameras that can be used to capture the beauty of our Underwater World. 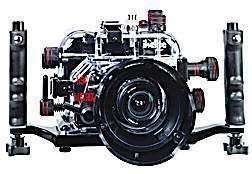 In this final article, we are going to take a close look at what can be done with your old Single Lens Reflex (SLR) camera that you already have, and consider the benefits of putting it into a housing for your next dive. The two important questions to ask are "What kind of camera do you own?" and more importantly, "Do you know how to operate the camera?" It is important that your present camera is an auto-focus camera such as a Canon Rebel EOS or Nikon N-65 or N-80. The auto-focus feature makes taking photos much simpler, and really improves your ability to capture the image of a sea fan or clownfish rather quickly. The next step is to choose a housing. There are about ten companies that make housings for SLRs but I will narrow this down to the two that are affordable. The best housing that I have found in the past five years and taken on more than 1,500 dives is the thermoplastic housing by Ikelite. In my opinion, they offer the best value for the money; but even more importantly, I have found the customer service and response from the company, and owner Ike Brigham, to be of the highest caliber. I personally own three Ikelite housings, and will soon purchase a fourth. Why? Because they are made of clear drop molded thermoplastic. They have no seams, and they are just one piece of plastic molded to fit around your camera. The company has an enormous number of molds, and chances are they will have a housing fitting your camera. Check at www.ikelite.com. Why thermoplastic? If the housing leaks then you can immediately see the calamity start and you can do something about it. All other housings are made from cast aluminum alloy and opaque. However, using thermoplastics versus aluminum alloy does have its drawbacks. With Ikelite housings it is difficult to attach a lens port for longer and heavier macro lenses used by professional photographers. Professionals also tend to have deeper pockets, and prefer the aluminum housings. An Ikelite housing will cost between $575 and $850 depending on your camera and the lens you like the most. I recommend starting off with a zoom lens somewhere near the stock 28-85 mm lens that came with the camera. You can expect to spend an additional $150 on a lens port and diopter for your camera setup and you would be in the water for less than $1,000. The aluminum alloy housings available to your camera are limited compared to Ikelite. Companies that make these housings specialize in Nikon and Canon systems only. I prefer the Nikon N-90 and the housing for that camera starts at about $1,500 and rises to $4,000. These prices do not include a lens port. The advantages of aluminum alloy housings lay in their claims of durability. At an average of $2,800 per housing I would like to think they would withstand a shark attack. But it seems the pros really prefer these expensive housings. The good news is that recently Sea and Sea has manufactured some entry-level housings that are closer to $1,000 for the Canon and Nikon systems. To sum it up, the aluminum alloy housing is expensive. If you have a burning desire to learn more about using your camera in a housing I will be conducting an Advanced Underwater Photography Seminar in September. The seminar will teach the use of a housed camera underwater, and serves to expand the horizons and capabilities of novice and experienced photographers alike. If you are interested in this class just e-mail me at john@jwchandler.com. I will reply with detailed goals and objectives of this seminar. Also, you will be happy to know that there is a new source for Sea and Sea Cameras on Okinawa. Drop by FATHOMS Dive Shop and see Rich. Talk to him about what kind of dream system you want and check his prices. He is a new outlet, and I am sure he will be competitive with other retailers. Sea and Sea makes a great housing for 35mm SLR, too! Housed cameras offer the most flexibility underwater while also allowing the use of your favorite camera that you already own. While housings are expensive and technically challenging the results can be well worth the money. I sure think.